Wow, wow, wow!!!. What more can I say???. So pleased everyone is loving Sheena's new stamps. As you could see they are defiantly magical. I bet you will all be stalking the stamp now, waiting to get your hands on them. Can't say as I would blame you can they are fantastic. I wanted to do a masculine card suing the stamps, which I hope I achieved. The background is distressed using black soot, and peeled paint and walnut stain distress ink. I then applied luminart pourables with a sponge to give a more blended and twinkling effect. Using the corner stamp (my favourite) I stamped it four times with Versamark, and applied a distress embossing powder to create the background. Brads were added for effect, some straw twine was wrapped around it, and the Matt and layered. The bird and branch was stamped and coloured with Copic pens, the berries had glossy accents applied, and then using Collal 3D glue stuck to the card. But, underneath it I applied some small pieces of the straw twine to make a little nest. The sentiment was embossed and matted and layered. I hope you like the card. Don't forget to watch Sheena at 4pm. I believe more stamps have been arranged at the multi discount price on advanced order, so if you missed out this morning, hurry and get them ordered, because they are a bargain at that price. Mine are ordered just got to wait for them to arrive so I can play. 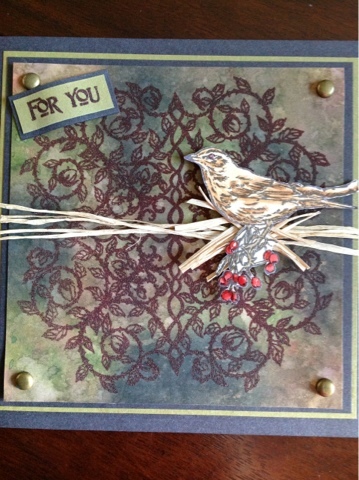 I love this card and how you have made a little nest under the bird. Love Love Love all your samples. This corner background is stunning. I really missed playing with these beauties but loved seeing what everyone had done with them.